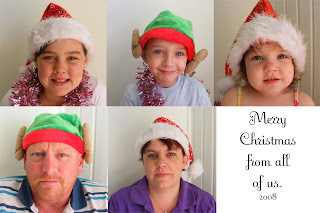 The monthly photography challenge at scraptherapy this weekend is related to Christmas... Challenge one is to take photos of a special decoration, and share the story behind it... challenge two is to share your family Christmas card, and challenge three is share a photo of Christmas baking... Christmas is in the air!! I'm baking tomorrow, and have no plans to put up the Christmas tree this weekend... but I was able to play with photoshop and come up with this collage of our photos that we took last weekend (note the new paint in the background... we took the photos in our newly painted bedroom) I love how this turned out (even though the bottom row of photos are slightly off to the top row...), and I definately think I'll be printing it out and using it for the rellies cards this year... must get cracking, I want them to go postal on Monday!